Only passing mentions to biblical scholars are found in this chapter (for the reason I mentioned above) and I will focus on those in this post. The first of these mentioned by Crossley is William Arnal whose earlier work, The Symbolic Jesus, is much shorter and (I think) a far more cogent argument explaining the larger cultural forces behind the various scholarly portrayals of Jesus. Certainly the concept of Jesus as one of Western culture’s major symbols being manipulated by various interest groups coheres well with the propaganda models of Harold Lasswell, Jacques Ellul, Walter Lippmann and Sheryl Tuttle Ross. The only propaganda model Crossley addresses is that of Herman-Chomsky, and that model, significantly, given Crossley’s dedicated focus on politics, sidesteps discussion of the power and manipulations of symbols. The Herman-Chomsky model concentrates on the filtering of political viewpoints in mass media. This is a major oversight or lopsided emphasis in a book that leads us to expect an analysis of how political and economic ideology has influenced Jesus scholarship. A book professing to explore the relationship of an iconic figure like Jesus with the broader cultural and political forces of the day is going to be very limited in its value if it ignores the way interest groups manipulate symbols. Crossley’s reference to Arnal and The Symbolic Jesus here is slightly bemusing. 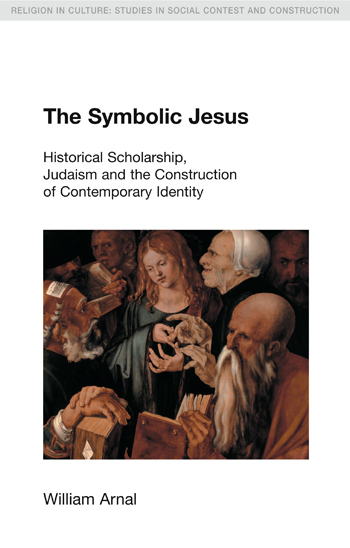 One of Arnal’s main themes is what he calls the “manufactured controversy” among modern scholars over the “Jewishness” of Jesus. Scholars like Crossan and Mack who have argued for, say, a Cynic-like Jesus are criticized by others for not, according to their own criteria, fitting Jesus into a normal Jewish setting. Yet Crossley’s own scholarly arguments about Jesus fall right into Arnal’s critique of having far too narrow a perspective on what Jewishness meant in first century Palestine — and this argument for what constitutes Jewishness by Crossley has decidedly political-racial overtones. Arnal’s argument finds Crossley himself among those guilty of being overly sensitive as to what constituted Jewishness and for creating a stereotypical, even possibly anachronistic, Jesus for modern political-cultural reasons. I anticipated that Crossley would defend his own position against Arnal but I don’t recall that ever happening anywhere in the book even though Crossley cites The Symbolic Jesus once or twice more. I am left with the impression that Crossley fails to recognize his own place in other propaganda models that place major importance on the use of symbols to shape and influence the views of others. Crossley certainly does his own manipulation of the Jesus icon for such purposes and he does so entirely unselfconsciously. It is actually where Crossley does manipulate his Jesus symbol that I part company with him on his political views and find him acting every bit as a “mask” for the power of select interest groups himself. But that will have to be explained in due course. I don’t quite know how to understand this rhetorical question since Bruce Malina is an ardent political supporter of certain “anti-Westerners” who criticize the way the “West” uses its corporations and governments in neoliberal neo-imperial adventures. Crossley might argue the systems of power will dictate how research appears at the publication end despite the personal beliefs of the scholar. However Malina is using the research of cultural anthropology and tends to set up comparative tables so readers can compare the cultural traits of an ancient Mediterranean culture with a modern American one — a process that to my mind would encourage some self-reflection and criticism. I can sympathize with Crossley’s intention to break through political conservatism and the tendencies of his peers to go along with assumptions and narratives that indirectly or directly support government and corporate actions that are very often harmful to others. I can’t help but question whether he is trying a little too hard to find fault where it is debatable. The next chapter is on biblioblogging. That’s where he engages much more interestingly with a number of biblical scholars. Posted on 2014-04-23 11:58:33 GMT+0000 by Neil Godfrey. 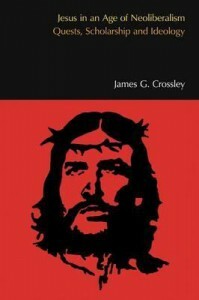 This entry was posted in Biblical Studies, New Testament Studies, Scholars and tagged Arnal: Symbolic Jesus, Crossley: Jesus Age Neoliberalism, William Arnal. Bookmark the permalink. The cover of Crossley’s book, itself, tells us a lot about why liberal atheists have difficulty questioning the historicity of Jesus. The symbol of Jesus is a powerful political tool against right-wing evangelicals. Holding up the example of an “authentic” Jesus who stands against religious fundamentalism and for things that liberals find worthy (compassion for the poor, etc), is a useful cultural weapon. Interesting point. Conversely (atheist?) Crossley’s ‘own’ historical Jesus is very much the stereotypical (conservative religious) Jew and he uses this symbol to fault Christianity for seeing itself as superior to Judaism. I take from Crossley’s arguments a strong criticism of Christianity coupled with a strong sense of political correctness in relation to questions that are collated under the rubric of antisemitism today. Speaking of that cover, what is Crossley trying to say about himself? That he’s a revolutionary? A martyr? Or is he going for some kind of “edgy”irony? Personally, I’m quite sympathetic to the postmodernist style of culture as Crossley defines it. I quickly stop being sympathetic, however, when postmodern affectations are employed on behalf of intensely judgmental political attitudes, which seems all too commonly the case. To use the outward forms of a style of thought for purposes that are fundamentally antithetical to it can only be described as hypocrisy. If one atheist believes Jesus never existed and another says He existed but rejects His claims and the gospels which record those claims, the fate of them both is the same. Both will remain seperated from God for all eternity. Their is no virtue in accpeting the historical Jesus while rejecting the Son of God and His atonement on our behalf. Just thought a bit of perspective might help concerning the bigger picture here. i would gladly remain separated from such a God who so abuses persons for using their rational faculties (a faculty given by that same God) to the best of their abilities and with the most sincere intentions to be as honest as they can be regardless of where that journey leads. How can anyone respect a God who punishes for eternity people who strive to be as honest as they can be with the gifts supposedly given by that God? The only answer to this question is to accuse such persons of being exalted in their vanity and self-deception. If God is that bad a judge of character, one who judges according to the stereotypes he himself has inspired in his written word, he is not worthy of any respect at all, let alone worship. The thought of spending an eternity with such a God is utterly repulsive. So Christians now go in for after-death threats. A lot better than death threats, but still not great.